Teaching how to plot is hard. In essence, you’re trying to teach someone how to build something when they can’t touch the materials they’re working with, can’t watch a demonstration of someone building the thing, can’t get their hands on a finished physical product to take it apart, can’t follow a pre-made step-by-step blueprint, and so on. Creative writing teachers show their students visual representations of plot structure in the hope that it’ll help. But there’s really not much to show about Classic Plot Design, which follows the ever-popular Hero’s Journey. It’s a simple linear progression from beginning to end, with a few basic elements labeled. There’s nothing wrong with the Hero’s Journey pattern. But the diagram doesn’t give writers much to work with, and it really doesn’t help people who don’t think linearly as create – which, let’s face it, is most of us. Classic Plot Design is especially unhelpful for writers who wish to produce more literary, character-centered fiction. Every time I teach novel writing, I struggle to find techniques I can offer to help nonlinear plotters create their stories. I often show the movie Wonder Boys in class as an example of a character-based plot that doesn’t follow Classic Plot Design. Usually we watch the film and discuss how the various elements blend together, but last week when after showing the movie in class, I was struggling to articulate a metaphor for how such stories were created, and I had – check this out, literary writers – an epiphany. In my mind, I saw a wheel with multiple spokes coming from a central hub, or more accurately, spokes which were leading TO a central hub. 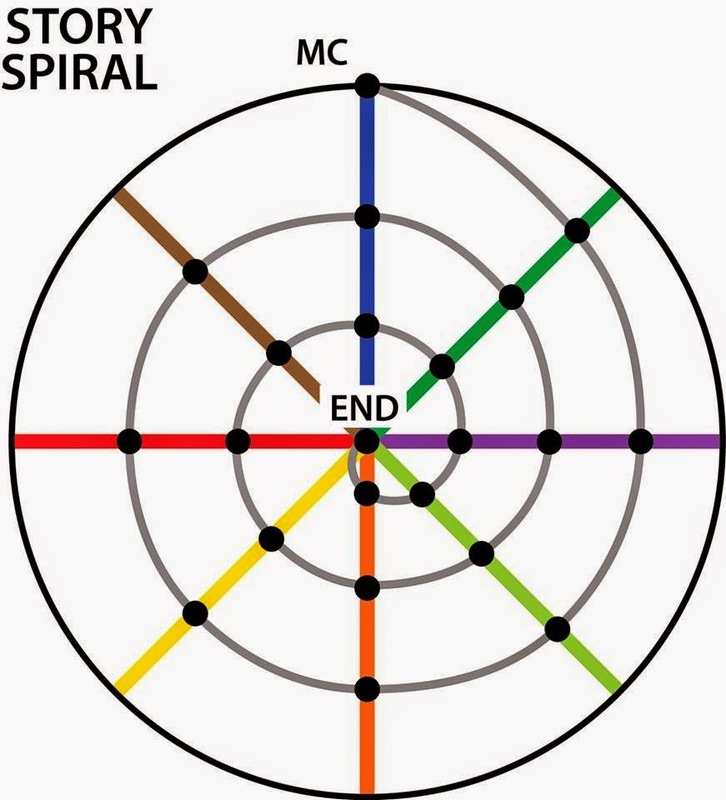 These spokes were different plots elements, the hub was the climax or ending point of a story, and the main character was represented by a spiral line which started on the outside of the wheel and continued circling toward the hub, touching the different spokes at various points along the way, and at each point the character engaged with the spoke in a different way that moved that section of the story forward. And thus the Amazing Story Spiral was born! To create a Story Spiral, draw a small circular in the middle of a piece of paper (or in the middle of your computer screen if you’re using a drawing program of some sort). This is the climax or the end point of your story. Then decide on various main story elements and draw a line coming from the middle circle for each of those elements. Then, starting at the top of the circle, draw a spiral line representing your main character which progresses through the spokes, curving ever inward in a spiral until it reaches the middle circle. Then go through the spiral and pick points where your character intersects each spoke and decide what event/story/character development will take place at that point. You can write notes about those events on the spiral itself, or if you don’t have room, on other piece of paper or Word document. When you’re finished, you have an alternative outline you can use as you draft your story. I realized this pattern could work well to help nonlinear writers – and writers looking to break away from classic plot design – so I introduced it to my students and we spent a class using the Story Spiral as a plotting exercise. Here are some of the things they discovered about the technique. · You don’t have to have your character progress through the spokes in lockstep fashion. Just because the spiral touches a spoke doesn’t mean you need to create a scene for that spoke right then. For example, in Jaws one of the story spokes would be the sheriff’s conflict with the mayor over closing the beach because of the shark attacks. Since this isn’t as important a story element as other spokes, the sheriff character only touches that spoke a couple times. Whereas, in Jaws, the sheriff is going to intersect the spoke representing the shark many times. · Spokes can end before they reach the hub, or the climax of the story. Some plot elements are resolved before the story’s end. For example, if one of the spokes represents a character, and that character dies halfway through the story, that character’s spoke ends. · You can create different Spirals for different characters/viewpoints. You can use the same spokes, but the different characters will intersect them at different times and in different ways. · You can use a Spiral to plot out a chapter or even a scene. · The tightening of the spiral mirrors the rising action of Classic Plot Design, but it implies a sense that opposing forces are drawing closer and closer to the main character, which more accurately depicts how a character feels as the events of the story draw near a climax.